The young and beautiful Crown Princess of Hawai‘i … a short, thin cry in a long night of weeping, a flag fallen…The Princess Ka‘iulani was born on O ‘ahu in 1865 to Princess Likelike, sister of Queen Lili‘uokalani and King Kalākaua. She was named for her aunt Anna Ka‘iulani (Ka‘iulani: highest point of Heaven) and for Queen Victoria of England. Just as her namesake Anna Ka‘iulani who died young, Princess Ka‘iulani was sadly called from this world in 1899 when she was merely twenty-three. Victoia Ka‘iulani Kalaninuiahulapalapa Kawēkiu i Lunalilo Cleghorn from the house of Kalākaua was heir to the Hawaiian throne. She left Hawai‘i in 1889 at the age of 13 to study in England; not only beautiful, Hawai‘i’s Crown Princess became fluent in four languages and exhibited considerable talent as a painter. SETTING: The mists of Hilo, in the mid-morning. As I stood watching the parade from under my umbrella, I was captivated by the wet reflections. Tired and dusty pavement was now resplendent with sparkling, glorious color! Every life experiences rain from time to time; the very rain that besets us throughout our lives can reveal and reflect a deeper beauty! 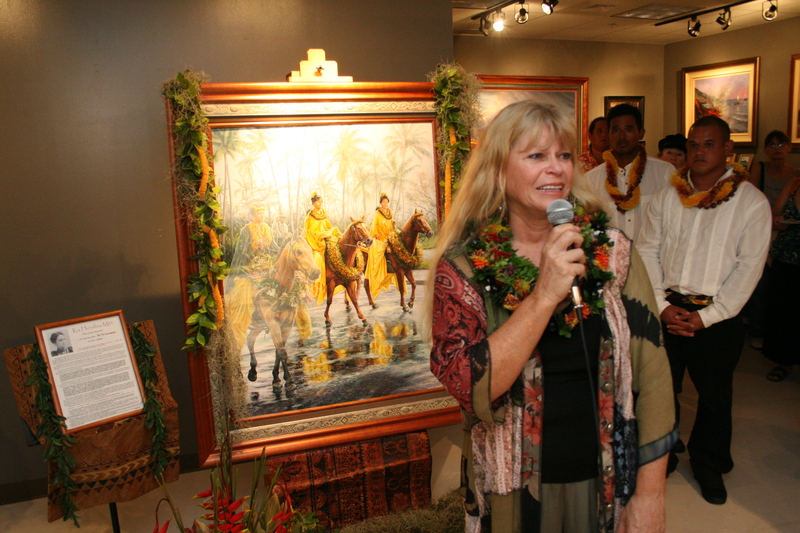 Because of her passion for horseback riding and her history as a Pā‘ū rider, I chose to portray Hawai’i’s Crown Princess on horseback, ‘ilima lei around her neck, the color of O‘ahu. It was after a ride in a storm that she contracted a fever and continued to decline until she died… a beautiful, courageous young princess too young to die…remembered with love by her people. 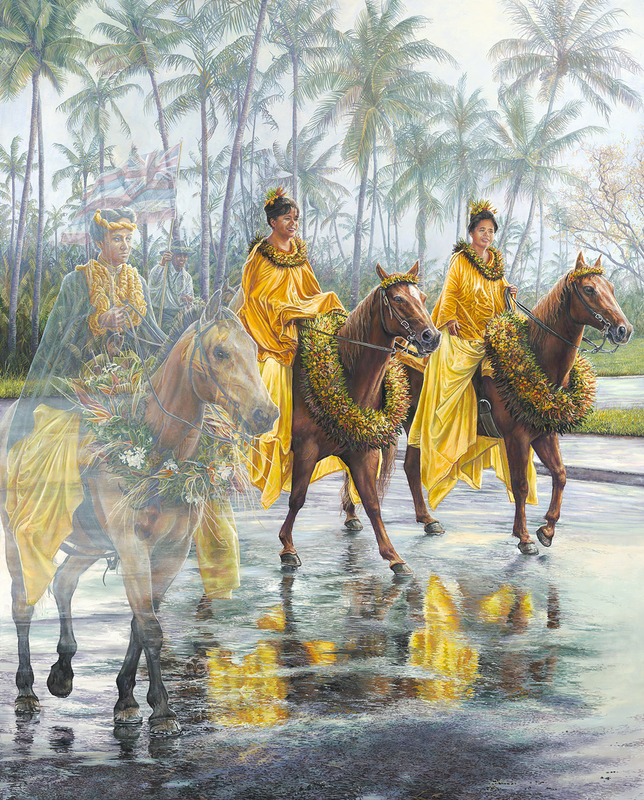 Pā‘ū riders are frequently seen in today’s parades, the longtime tradition originating from female riders of yesteryear with their long flowing colorful riding skirts (pā‘ū). Purchase Open Edition Prints in our online store. Click this link.